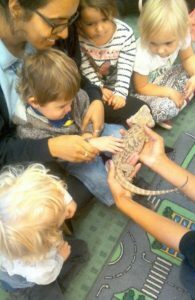 Youngsters from our Crabbs Cross nursery got up close and personal with some slithery, creepy crawly and furry visitors last week as they welcomed ZooLab into their setting, ahead of World Animal Day on 4th October. ZooLab is the UK’s leading animal handling experience and lifelong learning company. The children enjoyed listening and getting involved in the story of the Zagaro – based on a well-known children’s story, the hero is a ZooLab rat who takes a trip through a deep dark wood and happens to meet a whole host of fantastic animals along the way – some that want to eat him! 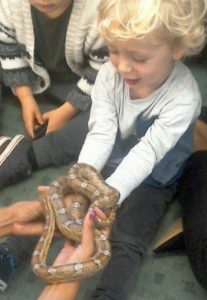 Throughout the story the children had the opportunity to handle a variety of animals, including a giant African snail, cockroaches, a bearded dragon, a snake, a tarantula and even rats! 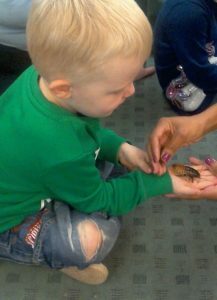 For more information about ZooLab visit www.zoolabuk.com.